Equipment | Barbed Steel Charters, Inc.
We will be fishing from my 2008 Hell’s Bay 17.8 Professional. 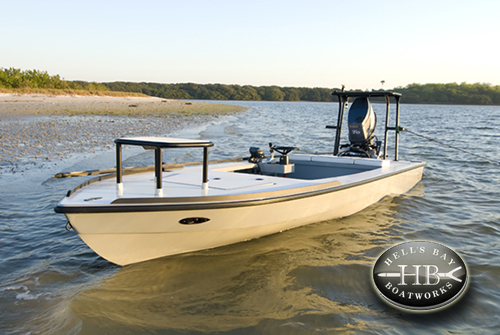 This skiff is very spacious for it’s size and can comfortably fish up to two anglers plus the guide. The 17.8 Professional has a very shallow draft of 6 inches which allows us to sneak up on fish in the skinniest water, yet she delivers a surprisingly smooth ride in choppy conditions. Come experience a day on the water in the finest technical poling skiff on the market today. My Hell’s Bay 17.8 Professional is equipped with the finest gear available to make your trip on the water a safe and pleasurable experience. All rods, reels, tackle, flies, and licenses are provided at no additional cost. If you wish to use your own tackle, you are more than welcome to bring it. However, please discuss this with me before your charter, so that we can make sure your equipment is suited to the species that we will be pursuing. I will also provide soft drinks, water and a cooler. Please leave personal coolers in your car as I have limited space in the boat and I require clear deck space for safety concerns.